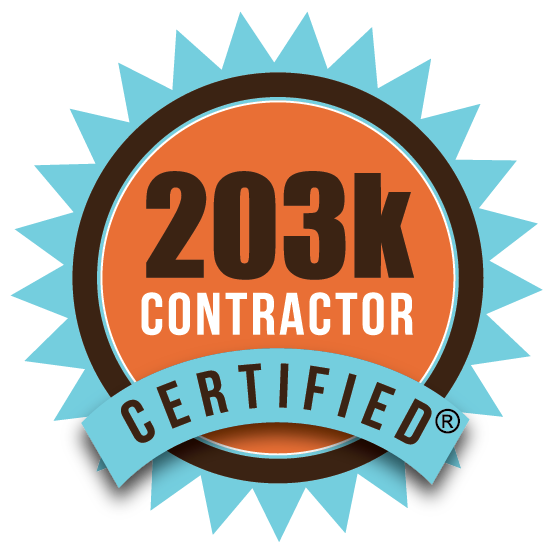 Are you in need of a 203k General Contractor? Tribest Construction, LLC can help you! Did you know that there are several 203k FHA loans a client can obtain? A homebuyer has the option to choose the 203k loans that best suits their buying options. There are two types of FHA 203k loans: The Standard (aka the Full or Rehab) and the Streamline. 203k Standard - The FHA 203k Standard/Full/Rehab allows for structural modifications, additions, landscaping, architect and engineer contracting and requires the use of a 203k Consultant. 203k Streamline - The FHA 203k Streamline, on the other hand, will not allow for structural modifications, landscaping, etc., and has a maximum repair limit of $35,000. Although FHA 203k loans can be used to refinance the home it is most commonly used to purchase homes that in their current condition do not qualify for traditional mortgage due to their unlivable or outdated condition. This is where Tribest Construction, LLC gets involved as your General Contractor. HUD/FHA requires all improvements performed on the property under the FHA 203k loan programs require the work to be performed by individuals or companies that are skilled in helping you during the 203k processes. Because the FHA 203k is not a normal loan and is somewhat, a unique government-insured restoration loan with specific government requirements, it is imperative to partner with a general contractor who has been properly educated and vetted. Tribest Construction LLC, are validated Certified 203k Contractors who can help walk you through this sometimes-arduous process with efficiency and ease. Tribest Construction, LLC is more than capable to replace flooring, kitchen remodeling, painting both exterior and interior, weatherization storm windows and door, along with a list of amenities allowed in the 203k loan that helps you buy and fix up your new home. We are able to help you process your 203k quicker and more efficiently. Are you in need of a 203k Consultant 203k General Contractor? Tribest Construction, LLC can help you! PERMITS / PLANS: We obtain all necessary county-state permits. We also assist you in obtaining quality architectural plans to have your own ideas incorporated into the home of your dreams. DEVELOPMENT: We construct your entire home from start to finish and assist in all phases of your 203k project. COST CONTROL: We provide affordable pricing of materials and labors to construct your project to fit your budget. The whole point is this: we are able to help you through the entire process. When it comes to selecting a superlative General Contractor there’s a lot to think about. How much will the repairs be? Who will be performing the work? Are the home improvement projects I have in mind eligible? Please consider our services to help you through the laborious process. We at Tribest Construction LLC strive to build projects and strong client relationships through quality, integrity, and teamwork. Please feel free to contact us if you are looking for an experienced 203(k) General Contractor. We look forward to doing business with you and assisting you by moving into your new home!